Synopsis : The bubble tube similar to a lava lamp as a sensory device provides benefits to children with relaxation and behavior problems. As a sensory experience, the bubble tube - similar to a lava lamp - is just one of a range of sensory equipment devices that provides a wide range of benefits to assist mainly children with relaxation and threatening behavior problems. The ascending bubbles and the constantly changing colored lights have a soothing and mesmerizing effect and the columns of bubbles also give off a gentle vibration. Found in nurseries and playgroups, special schools, family centers, and nursing homes, the bubble tube has proved invaluable as an aid in the exploration and development of all-important social skills. The bubble tube provides a restful and calming atmosphere, allowing health professionals to observe and monitor stressful behavior in patients. In many cases the bubble tube is used to promote relaxation for those who suffer from stress and agitation, and in some cases from those suffering from bouts of depression. Water is pumped around inside a bubble tube and the light is constantly changing color. 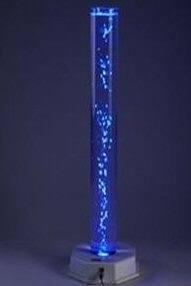 The air that is blown into the tube causes moving bubbles to shimmer and flicker and the resultant effect is calming and cannot help but draw attention. This effect helps promote visual stimulation and encourages touch through the faint vibration. The most advanced bubble tube in the education, medical therapy and leisure arenas is one that can be programmed to allow the colors and bubbles to be controlled separately, or in combination. The 14 different programs are designed for co-operative play as well as competitive games for one person or a group of players. This provides an invaluable tool for the development of many learning-specific skills as well as sensory experiences. This latest bubble tube enables highly-dependent people to interact with it and each other on a par with physically and intellectually more able people. More and more schools and health-care facilities are creating sensory or multi-sensory rooms stocked with a wide range of sensory equipment, which almost always includes a bubble tube. The sensory room's equipment is designed to help people with relaxation and concentration techniques and also to help young people in particular, with learning and behavioral difficulties. For best results it's important that the room is able to be darkened and is free of noise and disturbance. There are several sensory and multi-sensory carts available on the market, all of which can be stocked with a bubble tube, a sound system producing soothing sounds, an array of aromatherapy products, a projector to project relevant soothing images, scented lotions, and textured and soft objects for the sensation of touch. For more information see sensory equipment and sensory stimulation products. *News Release by experia-usa.com: Disabled World makes no warranties or representations in connection therewith. PR content may be edited for style, clarity, and/or length. If you are connected with this page and want it corrected/updated please contact us.